Rotating Parts Systems Engineering, Mechanical Drive Turbine Products Dept. General Electric Co., Fitchburg, Mass. General Electric Company, Mechanical Drive Turbine Products Dept. A comparison of the high-speed performance characteristics of tilting-pad, self-equalizing type thrust bearings through two independent full-scale programs is reported. This paper presents experimental data on centrally pivoted, 6-pad, 267-mm (10 ½-in.) and 304-mm (12-in.) O.D. bearings operating at shaft speeds up to 14000 rpm and bearing loads ranging up to 2.76 MPa (400 psi). Data presented demonstrate the effects of speed and loading on bearing power loss and metal temperatures. Included is a discussion of optimum oil supply flow rate based upon considerations of bearing pad temperatures and power loss values. This paper presents the experimentally measured values of bearing power loss and pad metal temperatures under variable load, speed, and oil supply flow rate. Information of this nature, especially in turbulent operation, has been very limited [1, 2, 3].1 The data presented have been obtained from two completely independent test programs, which were developed on two dissimilar test machines. When compared, the overall bearing performance is consistent. This paper is intended to present new test data as a contribution to the better understanding of the phenomenon of turbulence in fluid film bearings. 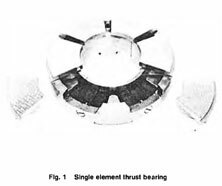 The bearings under study were the conventional 6-pad, steel-backed, centrally pivoted, self-equalizing, 267-mm (10 ½-in.) and 304-mm ( 12-in.) O.D. tilting pad type illustrated in Fig. 1. The experimental data reported on the 267-mm (10 ½-in.) and the 304- mm (12-in.) bearings were collected on two independent test facilities. The investigations studied the effects of external parameters such as applied load, shaft speed, and oil flow rate on the performance of tilting pad thrust bearings operating under simulated field conditions. Table 1 indicates the bearing sizes, areas, shaft speeds and applied loads. Bearing performance was evaluated by an analysis of pad metal temperatures and bearing power loss as influenced by variation of external parameters. A petroleum-based, light turbine oil with a viscosity of 32 µm2/S at 38°C (150 SUS at 100°F) was used as a lubricant in both test programs. The data herein represent only a portion of testing so far undertaken in the two research programs. A previous paper  has reported preliminary results on the 267-mm (10 ½-in.) bearing, and an additional paper  has been submitted relating to 432-mm (17-in.) and 381-mm (15-in.) bearings.